← Update on the reunion of Rusty and Timber! Rusty and Timber together again! Here are the words of Jay’s daughter, Daisy, which she wrote in an email sending photos of the reunion. Her words tell the story very well. “Rusty sat in his chair and my dad walked Timber over (or perhaps a better way to write it is Timber pulled me dad over). Timber jumped up onto his lap and they kissed. Rusty held Timber. 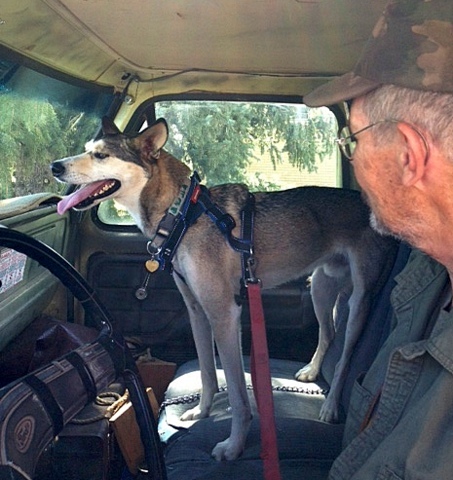 “Then, Timber jumped up into the truck and onto his seat. . .
Rusty hopped in with him. Timber looked in his water cup (a large Styrofoam cup nestled in the floorboards that Timber would drink out of). We poured some water into it for him, and Timber drank the water. He laid down and then sat back up. He seemed very happy and content to be in his seat, the same seat that he has had for almost 4 years. 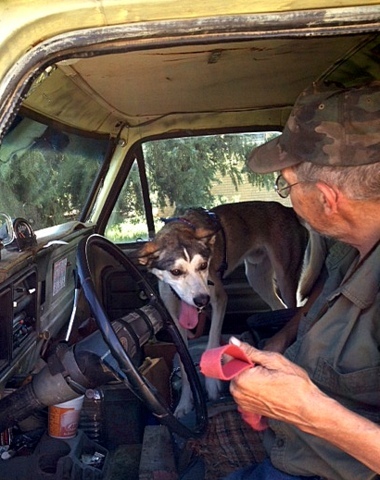 “Then Timber wanted out of Rusty’s truck and ran around into the back of the camper. Timber crawled into his bed, under Rusty’s bed and looked up as if to say, yes you are really you. “Then we ate lunch, Rusty wiped tears at his eyes, and Timber would not keep his eyes off of Rusty (it was as if we no longer existed). Timber also did some new tricks that we had not seen before (like shake and high five). This entry was posted in Simple living and tagged reunion, Rusty, siberian husky. Bookmark the permalink. 92 Responses to Rusty and Timber together again! Daisy is resending the pictures in a smaller format. Check your email a little later. Yay!!!!!!!! The pictures are priceless! The pics came in my email and they are in the blog entry above . . . Wonderful! Tears of JOY here! Absolutely wonderful! So happy for both Timber and Rusty! The pictures say it all! Timber is home! Thank you everybody who put this amazing reunion together!!! joy!!! Allergies must be bad today, can’t seem to stop my eyes from watering. This has happened several times lately. Sorry about that Mark… Well, not really. I want to say this is “amazing”, but that’s not the quite the right word – this is a reflection of the real people in this country, the ones who care, the ones who respond when there is a situation that needs attention, love for each other and our animal companions. The “amazing” part is that it was able to happen so fast because one person – Sue that’s you – put in her blog about a man and his dog and it went viral. Would this have happened ten years ago or even 5 years ago? No, because we didn’t even know Sue for one thing and even 5 years ago not as many of us were into this electronic communication/social media stuff like we are now. And yet, here is a “community” doing and acting on a request – a community of strangers. Thank you Sue. My hope is that this incident is a teaching tool, as well, to all who have pets in the wild. Things can and do happen, and a domesticated animal in the wild usually can not fen for itself and winds up being prey. I’m very happy for Rusty and Timber, but I wonder how many times this happens without a happy ending. My comment isn’t meant to take away from the joy and Sue’s effort and the community’s effort, but food for thought for anyone who could fall into the same predicament, unwittingly. Tears in my eyes…smile on my face and thanks giving in my heart!! I think the allergy season is really bad all across the country right now……where are those dang tissues. Yep – I’ve got it too. Watery eyes, big smile. Whenever we are feeling discouraged about mankind, just re-read this story and know that there are good , kind, caring folk out there. Thanks, Sue , and everyone who had a hand in making this possible. Awww I can imagine Timber doing the doggie “hello” . It must have been quite loud. This is so nice!!!! Sue this is a very special story. It’s not everyday that things work out so well. I wonder if you would consider putting the relevant post together, or even rewriting it as it’s own story and putting it on your Blog as a Page alongside About RVSue and etc. Pleased that you could be an important link in this, Congratulations on using the opportunity and tools you had. Awww !!!! What a happy day !!! Do glad you could share this with all of us . Timber spoke loud and clear about his happiness. What a glorious day for Rusty, Timber and all the caring folk of this community. Tears here also. I second what everone is saying about Sue and this community of caring people. If Sue had not been brave/caring/nonjudgemental enough to make friends with Rusty in the first place, this never would have happened. And let us not forget Jay and daughter, Daisy. She advertised Timber’s ‘rescue’ and Jay, after having Timber long enough to get attached, was kind enough to give him back to Rusty–great people! Thanks to all involved; so nice to have a happy ending. Thank you, Sue, for sharing Rusty and Timber’s story with all of us. What a wonderful feeling to witness their heartwarming reunion. Thanks and blessings on the many who had some part in bringing these two back together; it seems the same as returning a lost child to his parent. Maybe that’s dramatic but a pet owner feels the emotion and understands the joy. Pat K.
I’m thinking Rusty is going to share his bunk with Timber tonight. Sleep tight Rusty and Timber……….tomorrow is another day…have a safe journey home! I’m writing this on Monday the 3rd (Labor Day). I spoke with Rusty last night. He said as soon as his feet leave the floor, Timber will be in bed with him. Rusty’s on the road today. Thank you to everyone for your prayers on his behalf. Awww…that must make you feel wonderful, Sue. Thank you, for your blog. I am very happy for Rusty and Timber and to have seen this all come together in a relatively short time. I’m sure it has been ages in Rusty and Timber years. I am grateful for the kindness of all the strangers who have become acquainted thru your blog. Kansas is dreadful for allergies, Mark. Even in Overland Park we seem to be afflicted. We have a daughter that lives in Lenexa. They have two cats that are like their kids. They set up a camera to watch them while they are gone. They can view the cats from their smart phone any rime. We’re WELCOME, Sue. You made it happen, my friend, and I am grateful. Truly a remarkable story. Happy tears as I’m holding my little Millie. WOW. What a wonderful day. Sue, how could you have imagined that you would have this kind of impact in just a year (ok, maybe a little over a year) on so many people? I’ve shared the story because it is a wonderful thing to hear such a heart warming story. I’ll bet you’re right–Timber seems so glad to be home, and I can’t even imagine the joy that Rusty feels. What a gift! And, yes, I bet he does hold Timber’s leash even inside the trailer!!! I felt great relief at the news that Jay and his daughter had Timber–I really had my doubts that he’d be found. Like a miracle when you think of all the possibilities. Thanks for sharing, and facilitating in a major way, such a wonderful story with a happy ending. So glad it ended this way!! Thanks for your part and for sharing!! And to learn of all those who helped and wanted to help…we do not often run into such kind of people…that is so encouraging!! A leash is a good thing for a dog, really. It is protection. If our neighbors had been more to use a leash, they would still have their 8 year old dog. It ran over to a neighbor’s and drank antifreeze a little over a week ago and of course, it is no more now. The owners never worried about the dogs getting out and bothering others…and now, well, no dog. Who knows, maybe the neighbor was working on their truck or car and the dog ran over unexpectedly…the neighbors have dogs too…so surely it was not something just left out. I have always felt it was important to keep one’s dogs at home as well as their children. Our dogs would not leave even when workmen left open our gate and we did not find it for 3 days…but most dogs are not quite that trustworthy. We did keep them on leash when outside the fenced areas and walking in the road, etc…so we could pull them back from problems too. I hope those living as fulltimers will be extra careful with their pets. A good warning. Rvsue…excellent report on Rusty and Timber and Timber’s rescuer. I noticed Rusty had the lead on Timber in the pics. Smart. I think they are leaking…. Thank you, Sue, for starting the ball rolling on this precious reunion. And a very, very special thanks also to Jay and Daisy. And a big Thanks to Cinandjules for finding Daisy’s post of finding Timber/Willy!!! Great detective work Cinandjules!!!!! Yes! Thanks to Cindy and Jules! Special Thanks to Jay and Daisy, Sue, and all the other folks that may have missed. May God Bless you all…..
You are the hub around which this story turns. So many happy people thanks to you, the wonderful folks who follow your blog and the fabulous people who kept Timber safe. But none of this could have happened if you hadn’t met Rusty and then talked to him again. It’s just simply amazing. I agee Sherry! God works in mysterious ways! Allergy’s in Oklahoma too, darn they sure are bad tonight, Kleenex please! I just so happy things eventually worked out and Rusty and Timber were reunited. I know that you were such a major source in enabling this to happen. You deserve a HUGE ATTA GIRL. A lot More than one: ATTA GIRL, ATTA GIRL, ATTA GIRL !!!!!!!!!!!!! alll huge. I have to say a big thank you to the internet and the internet community! If Sue hadn’t posted on her blog, and caring people hadn’t had the ability to search the internet, there would be no happy reunion. What a great way to use our technology! THANKS SO VERY MUCH for the self-less acts of thoughtful and kindness you have bestowed on others with nothing but pleasure and love!! I consider you among my “most admired”, and have never met you! Your care and friendship with Rusty seems to be the ‘connection’ that was able to make it work, and I know there is a special place in Heaven for hearts and and souls like you! I’m going to follow your example and be more open-minded, thoughtful, and kind when meeting people who don’t choose to live a life-style similiar to my own, and I will respect them and their choices more than ever!!! You are truly a perfect example of thinking of others more than yourself. 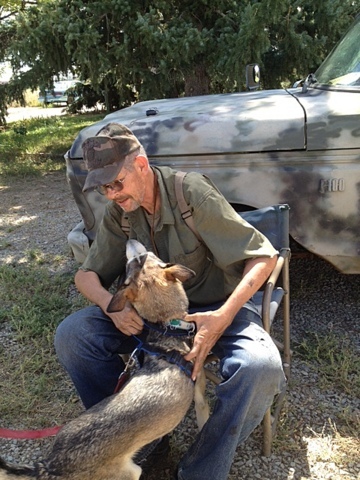 I’m thrilled that Rusty and Timber are reunited, ……..but it’s likely it would never have happened if you hadn’t cautiously befriended the ‘camo man’ and be willing to ”trust, but verify” and then follow your instincts and your heart!! So awesome that he trusted you and let you into his world! You have been the ‘catalyst’ that makes things happen! We should all be so brave!! When you get a chance, I’d love an update, and perhaps an address so I could personally send him a gift card to a ‘source’ in his area so he can get things he might need!! One man and a dog are blessed, …………as are all of the rest of us!! 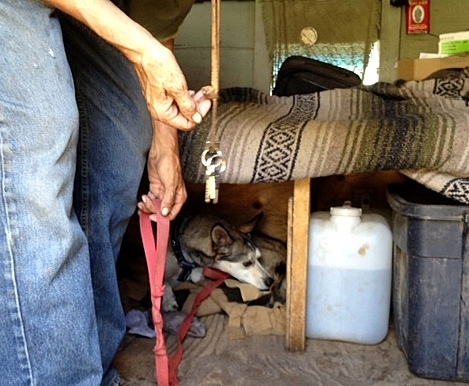 Once Rusty is back in Arizona and camped in the same spot for several weeks, I’m hoping I can get him to rent a P.O. box so he has a mailing address. I’ll share the address with you on my blog (making an exception to my no-money-business-on -my-blog policy.) Then you would be able to send gift cards, checks or money orders directly to Rusty without my involvement. Thank you for your kind words Becky, and your generous heart. I posted the link the the USA Today article on my FaceBook page, so even more people will see it. thank you all, i thought i would die without my timber, but now we are together agin and doin real fine. i ask you all to give to others who are in worse times than timber n i, for i can not receve gifts of $ value or i could lose my va pension.,but keep love in you all’s hearts, and may The LORD JESUS CHRIST Bless you and keep you all well and safe, THANKS ,, From,,,,TIMBER AND HIS BEST FREND RUSTY…………………….. I think you’re going to have to change your bloghandle to Angelsue. Those who know me well, Mareena, are surely choking with laughter! Rvangelsueandcrew…….yep has a nice ring to it and an apt description! What a beautiful reunion! Te angels have been watching over them, and you are one of those angels! What a happy ending, I bet you wish you could have been there to see the reunion. You are a special person as are the folks who got the dog saved and back to Rusty. I’m sure that Jay must have bonded with Timber, so he probably is feeling sad but also happy at the same time. He also is special. Sue and others were “God’s tools” to make this wonderful reunion happen… no such thing as coinkinkdinks…ALL is part of God’s plan no matter how small it may be. God Bless Rusty,Timber, Sue and all others that played part in this wonderful renuion of a man and his canine companion. GREAT, GREAT, GREAT story ….THESE are the kinds of stories that should make the national news! Am grateful to have been a witness via your blog. Please keep us posted about Rusty and Timber as you travel. They have certainly become a big part of your developing story that I so enjoy and share with others. I will keep you posted. I’ll be making efforts to see Rusty and Timber again within the next year and I’ll share that with you. I love happy endings and this is one of the best. There’s also a neat story here in Montana about a lost dog found. Bella was involved in a car accident where an 8 year old boy was killed and she ran away. The younger brother, 5, was devastated and an all out effort was made to find Bella. She was scared to death and wouldn’t let anybody near her. It took about three weeks but they were finally able to trap her by putting her toys and treats in a cage. What a happy reunion. Thank you for taking the time to help Rusty and Timber. Wonderful people who really care. This is just the sweetest most incredible story! Thanks Sue for caring enough to put it out there…just amazing!! This is a great ending. Sue another question for you , could you do without the inside shower, and how much do you use it. Hummmm now that question sounds bad ,hope you take it the way I meant it LOL. I use the inside shower only occasionally. It doesn’t have the pressure to rinse the shampoo out of my hair so I always wash and rinse my hair using dishpans outside on the picnic table or my small tables (unless a shower house is available, of course.). Maybe a guy with short hair would find the shower adequate. I’m soooooo very happy for them!! What a great story, wow, lucky Timber! And you can tell how much Rusty adores him. I’m so very glad to hear that they are now, finally reunited. Thank you so very much for keeping us updated on all this Sue. Ya done good girl!!! Give those two of yours hugs for me. Sue, thank-you so much for sharing this touching story about Rusty and Timber. Who can read these passages and not feel the warmth of friendship. So many have expressed their concern about my solo RVing. Concerned for safety reasons and fear that I will be lonely. I am not concerned about either. There are so many who are out there like you who extend the hand of friendship and concern for those who need it. I am please to be part of such a community. What a wonderful story! Can’t wait to see the reunion pictures!! Thanks to everyone involved. I loved to see this story find a happy conclusion! My friend Carla had told me the story. those allergies are here in texas too, can’t seem to see to type this very well. be blessed! USA Today!! Wow! That is big time. Will have to look it up. Thanks for letting us know. Found the story in USA Today! Poor Bridget, they changed her name to Badger. A sore leg and a name change! Tracy, can you send the link or share the headline so we can do a search for the story too? I found the think all by myself! surprise surprise! Here it is! I am a 76 year old man who loves animals and some people. This story made me silently weep. Oh it was happy tears. God Speed Rusty and Timber may you always have the best friend in the word, each other. Sue….You are an angel. What an amazing story and what a happy ending! I could not imagine what life would be like without my canine companion by my side. So, so, so happy for Rusty and Timber!!!!! I’ve been in the wilderness for two weeks, with no internet, so it was sure nice to get to town tonight and find the “reunion’ has happened. Hope the pup sticks close to home in the future.